Septentrio announced that Raven Aerostar, a manufacturer of Lighter-Than-Air (LTA) platforms, integrated Septentrio’s AsteRx2eH, a single-board dual-antenna GPS/GLONASS heading receiver into their tethered aerostat systems. 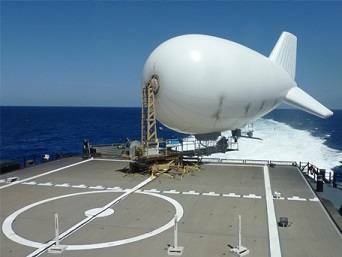 Raven Aerostar recently completed a maritime persistent surveillance solution demonstration, deploying a TIF-25K aerostat system aboard the High-Speed Vessel – SWIFT (HSV-2), during which the AsteRx2eH performed remarkably, the company said. Integrating the single-board AsteRx2eH dual-antenna receiver to replace a solution based on two separate GNSS receivers, allowed Raven Aerostar to achieve a reliable and accurate heading solution while also decreasing deployment time and total cost of GNSS sensors. The AsteRx2eH provides a compact and low power solution for precise positioning combined with accurate heading information, produced at a high output rate. The tracking of both GLONASS and GPS satellites allows the receiver to improve the availability and robustness of a solution in challenging environments. The AsteRx2eH is a globally acclaimed OEM solution with field proven performance for land, marine and aerial applications. It is for example used onboard helicopters and aerostats during stabilized flights hovering at low dynamics, where inertial sensors cannot easily provide a drift free solution. Another application is delivering reliable heading information for driverless ground vehicles, even at very low speeds.